Paranormal Romance and More: Interview & Giveaway with Christine Warner author of Two Timing the Boss! 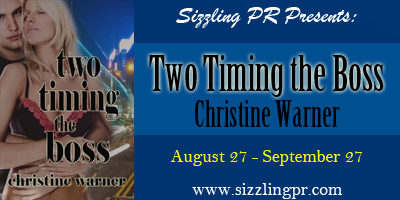 Interview & Giveaway with Christine Warner author of Two Timing the Boss! Please help me welcome author Christine Warner to Reading with Holly to talk about her book Two Timing the Boss! :) Don't miss the excerpt and giveaway below! Holly: Hi Christine! Would you tell us a little bit about yourself? Christine Warner: Definitely! But first let me thank you for having me on your awesome blog today! Let’s see… I live in Michigan along with my husband. Two of our 3 kids live at home and we share our space with 2 golden retrievers and 2 very spoiled cats. I love to cook, read, laugh, watch movies and spend time with my family and friends. Other than that I am slightly addicted to social media, chocolate and coffee. I enjoy meeting and talking with other authors and readers and pretty much anyone in general! Christine Warner: When I was in elementary school I won an essay contest and then a young author’s award for a book I wrote that was bound and displayed in our school library. From those 2 experiences I was bitten by the writing bug. I dabbled in it off and on for years, but really nothing serious. Growing up and life got in the way but it was always at the back of my mind. Holly: Can you tell us a little bit about your book Two Timing the Boss? To secure the funds for her twin sister's surgery, Farah Smith will need to sacrifice her values as well as alter her appearance to work for a man she finds morally bankrupt. With a blonde wig and stilettos strapped on, Farah’s a clone of Keller Donovan’s harem of past assistants, insuring a position within his company. Disillusioned by his parent’s disastrous marriage, Keller Donovan is determined no relationship should have more than a six-month shelf life. But after he meets Farah Smith, all bets are off. Suddenly he wants more than a personal assistant and private bed warmer. Unfortunately, his offer of an affair doesn’t sit well with her, despite the stranglehold she's put on his heart. Holly: Where can we purchase Two Timing the Boss? Christine Warner: You can actually purchase Two Timing the Boss and my other book (which was my debut) Some Like it in Handcuffs at the following links. Both are available in print and ebook. Just go to the links and type in the titles or my name and they’ll be there. Christine Warner: That’s kind of up in the air right now! Lol I have a book with Entangled Publishing but I don’t have a release date yet…so stay tuned. And I hope to have several ready to sub my years end for a hopeful release in 2013. Christine Warner: I’m actually working on 3 stories at the moment. Two contemporary romances and another romantic suspense. I’m excited about them, and hope to finish all of them up by years end. Christine Warner: The first book I wrote was Some Like it in Handcuffs which is a light-hearted romantic suspense with humor. I submitted the manuscript to The Wild Rose Press and they contracted the story. The process was long for my first book, about double the amount of time it took for Two Timing the Boss to release. If memory serves me right, I submitted that first book in December 2010 and I was offered the contract in April of 2011. From there I went through a couple rounds of edits and galleys and got the book cover and then the release date, which was March 23rd of this year. Holly: Your life is a romantic comedy; what humorous but very embarrassing thing happens on your first date/when you meet the love of your life? Christine Warner: I think it’s a mixture. I’m a people watcher and also a good listener and have taken things from my own life experiences as well as what I’ve heard from friends, family and co-workers. I don’t believe you could pinpoint anything to one exact person, but it’s a recipe of several people. There’s nothing better than borrowing traits and habits or experiences from real people to make your own characters more 3D. Christine Warner: The first romances I read were contemporary and they’ve always remained my favorite. I feel like I know them best and I like the fact that they take place in the here and now. Makes it seem like it could really happen…to anyone at any time! Christine Warner: The balancing act. Finding time to write, have family time, market yourself…I admit I’m horrible at personal time management! Christine Warner: First off, thanks for coming by today! Also, please leave a comment to be entered for a chance to win a copy of Two Timing the Boss. Christine Warner: Definitely coming up with story ideas. I can get an idea from a television show, a sentence, a single word, something in a conversation, a picture…they possibilities are endless. Christine Warner: Usually in the evenings. The house is settled and I can totally let myself fall between the pages of a good book. Christine Warner: I still love holding a paperback book in my hands, but I also have a NOOK and I am filling it up pretty quickly. I like the convenience of it. So I can’t really choose…it just depends on the book and my mood. Christine Warner: Love the bold, brightness of RED! Christine Warner: How about any chocolate? Lol White chocolate, dark chocolate, milk chocolate…if it’s got chocolate I prefer it! Almost to her destination, with no more mishaps, her confidence surfaced. Okay, maybe mastering this heel thing wouldn’t be such a big deal. Her steps became light, almost bouncy. Although she sensed Keller Donovan behind her, she didn’t let it deter her feeling of success. She stepped onto the large black and red area rug, less than ten feet from her target. The leather chairs. But nothing happened. There were stars all right, and a blazing jolt of electricity shot from her toes, up her legs, through her body and exited with the small gasp that escaped her lips. Somehow Keller Donovan had grabbed her around the waist before she met the floor. Thanks to her older sister, Christine learned to read and write before kindergarten and from there her love of books grew. She still owns the first book she ever read, a tattered and well loved edition of The Kitten Twins. Besides laughing and a good round of humor, she enjoys spending time with her family, cooking, reading, writing, but please—no arithmitic. A confessed people watcher, she finds inspiration for her stories in everyday activities. She admits to having a future stories folder bursting at the seams, the trouble is trying to decide which story to start next. She loves to read and write romance about strong heroes and determined, sometimes sassy, heroines. And she has a fascination with true crime novels as well. I've not read any of her books, but I would love to! Great interview and excerpt. Christine, I'm with you. Any chocolate will do. Aw yes....I'm with you on that Sharon...chocolate and peanut butter is a definite YUM! I've been told that white chocolate isn't real chocolate, but who the hell cares, right? Unless you want it with peanut butter. Don't think that would work. It's the best! Loved the interview and the excerpt! Looking forward to what you come up with next! Great interview, ladies! I'd have to go with milk chocolate. Almost anything covered with chocolate counts, too, except raisins or insects. Can't wait to read this one! I love that - "social media, chocolate and coffee" - only slightly addicted. Great interview. LOL..it's sad but true Maddy. Glad you enjoyed the interview! great interview - I'm a social media aholic, too...I'm trying to learn to cut it off! LMBO...sounds like your reading pile is out of control! I'm with you, Christine--I'm a social media junkie. It. Has. To. Stop! Oh, and any type of chocolate is good chocolate, LOL! I havn't read any books by Danica Avet before yet. The excerpt ROCKS and the interview does too! Hi Mindy, thanks for coming by. Great interview, ladies. Just when I thought I knew everything about Christine, eh? Best of luck with Two Timing the Boss, it's a great read. Loved this post, Christine! Both books sound good, something I'd like. Good luck! Awww...thanks Gerri...I really appreciate that. I hope you get the chance to read them and thanks for coming by!!! I've never read one of her books but I hope I get to read this one. Hi Lisa, I hope if you read either one you enjoy them. Both were fun to write! Thanks so much for coming by and commenting. Great interview, Christine! I'm with you about the chocolate. Love it Sara...thanks so much for coming by...glad you enjoyed the interview! This book sounds great. I will have to check out Christine's books and I totally agree that all chocolate is great! Much like the type of book I want to read at any time, the type of chocolate that I want also depends on my mood. Thanks so much for stopping by. I hope if you get the chance to read one of my books you enjoy it!